I chose to drive north towards Berlin rather than stay the night in Dresden so that I would be in a prime position to get up the next morning and return the rental car in downtown Berlin. It was nice to be back on the autobahn. When I had a free stretch of road and no limits on my speed, I would press my foot into the floor and let the car soar down the road. It’s really the way highway driving should be, so, if any US legislators are reading this, draft a bill right now. 55 stay alive is nice, but what’s the point of living if you aren’t really living. And, just for your information, I never saw a traffic accident on the autobahn, and everyone followed the rules. When they came to a place where they were required to slow, they did so dutifully. They always moved to the right so as not to impede faster traffic. It’s not chaos. It’s structure that allows for freedom. So, I was driving down the autobahn, heading north towards Berlin, when I looked to my right and saw past the fields and the trees, many kilometers from the highway, a giant metal dome. I was immediately intrigued, so I pulled over at the next stop to investigate. It took me about 10 minutes to read the place, which I soon discovered was a resort called Tropical Islands. The dome itself was huge and surrounded by mass parking. I saw families carrying bags and luggage walking to their cars. This is what Tropical Islands looks like on the outside. Click on the link above to see the inside. It’s quite impressive. When I entered Tropical Islands, I was totally blown away. They had created a warm and humid atmosphere within the dome. There were massive pools, restaurants, bungalows, and even tents. You could go for just the day or stay overnight. Tropical Islands is a 24/7 paradise. There were families everywhere–checking in, checking out, getting changed to swim for the rest of the evening, loading on the buses that waited outside, or heading to their cars to return home. 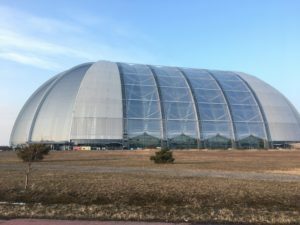 Later, my Couchsurfing host in Berlin, Andrea, would tell me that the dome was an old zeppelin factory and that after the production of the zeppelins had stopped that it had been converted into a resort. I considered staying for the night, but, when I looked at the brochure, I decided that the price was too steep for me just to crash one evening. And I’m so glad that I made that decision because that’s how I discovered the second wonder of that day. My handy GPS led me to a little village just down the road where I found Landhotel Krausnick. This family run hotel is located right next to Spreewald, a natural reserve filled with trails that weave through beautiful forests. Now, I had had my fill of people in Prague. I really needed some time alone in a quiet place, and what I had found was perfect. I truly didn’t think that there was a single other guest in the hotel for while. I even began to worry about the financial well-being of Margaret and her family. Margaret and her family run the Landhotel Krausnick on the edge of Spreewald. When I came down to the restaurant for dinner, though, some people started to trickle into the hotel. Families. This was a perfect location for a family getaway. It wasn’t too expensive and it gave people the option to wander the woods even up to the lake to the north or spend a day at Tropical Islands. Margaret showed me the menu and asked me what I would like in her limited English. I asked her to bring me what she loved to cook the most. That’s right. This little restaurant run by this family really isn’t like a city restaurant where you have a clean-cut chef, looking dapper in his uniform, cooking with an army of sous chefs. 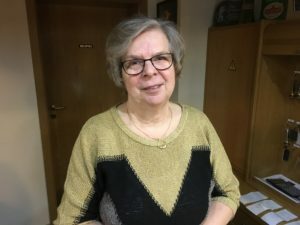 “I make you wiener schnitzel and bring you nice German beer,” Margaret said. I knew I was getting a home-cooked meal from a German grandmother, and that, my friends, is a pretty amazing thing. This was the thickest cut of wiener schnitzel I’ve had. The breading tasted like kind I’ve had on home cooked southern fried chicken back home. 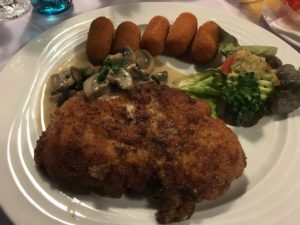 The mushrooms were boiled perfectly in a broth that made schnitzel come alive even more. Simple, basic, and beautiful. I will say this. It was the best food that I had eaten since I reached the mainland of Europe. Hands down. Bar none. Simply brilliant. When I was sated, I returned to my room and slept so soundly that the morning itself felt ashamed for awaking me. I wrote in an earlier post that I’ve wondered if we find what we need if we just stop trying to make things happen in our lives. I don’t think I said it exactly like that, but that’s the idea. I needed a place of peace, and I found it in a sleepy little town, away from the speeding cars on the autobahn and beyond the silver dome containing the tropics. Until my next post, keep looking to the heavens and seeking your own stars. I looked up images for Tropical Islands. It reminds me of The Truman Show!